Houses & Homes VA: Should you keep a gun in your home? Should you keep a gun in your home? This is an issue that has been debated for as long as most of us have been alive. While every American has the legal right to keep and own firearms (with certain restrictions) in their home, some people feel that this is a situation that offers more risk than reward. The issue is complex and it can be quite difficult to decide if the pros outweigh the cons for many of us. It is estimated that 80 million Americans currently own some type of gun (or guns) and approximately 223 million of them are registered. It is impossible to estimate the number of unregistered guns but many think that there may be more of these around than one might think, especially among the criminal element in our country. Here are some points to consider from both sides of the argument. Many people consider a gun to be their first line of defense against home invasions. With crime ever on the rise in many cities this is a hard point to argue. There is a certain sense of security that comes along with keeping a weapon in your home. 74% of felons surveyed admitted that knowing a homeowner has a weapon is enough reason to find an easier home to target. Proponents say that it is possible to avoid anyone from being hurt simply by threatening the "would be" burglar without the need to fire a single shot. There are many documented cases to back up this theory. Homeowners that do not agree with the idea of keeping a gun in the home also make some valid points to consider. The first concern is, of course, for the safety of our children. Nothing is more dangerous (or scary) than a loaded weapon in the hands of a child. A recent survey of gun owners concluded that a shocking 22% of the children in the homes (whom were questioned separately) did not fully understand the risks involved with guns and felt that they could possibly hurt themselves or someone else when “playing”. There are additional risks for adults as well. Studies also show that guns are responsible for the death of a family member 18 times more often than that of an intruder, a startling statistic. But do we blame the gun, or the gun owner? Those in favor of gun ownership point out that every kitchen has a knife and angry people will simply use whatever weapon is available at the time. The American Foundation for Suicide Prevention reports that 83% of gun related deaths in the home are due to suicide and not always by the gun owner themselves. Regardless of your personal opinion it is a fact that it is legal for Americans to keep guns in their homes. If you have or plan to buy a weapon for home protection than there are some common sense steps that you must take in order to ensure that no one in your home becomes the next statistic. BE SURE TO KEEP YOUR WEAPONS OUT OF THE HANDS OF OTHERS, ESPECIALLY CHILDREN AND YOUNG PEOPLE. It is your responsibility to guarantee that your guns are not used by someone else for the wrong reason. If someone is injured or killed using your gun, you are partially responsible. And let’s not forget being responsible for your own actions as well. Drinking and loaded weapons go about as well together as drinking and driving. Use your common sense and never, ever consider a gun as a solution to a problem. 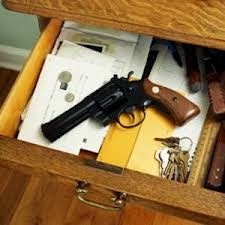 Unless you are cleaning your weapon or using it to defend your home from an actual threat, leave it stored safely away. Think of it as a good life insurance policy; it’s great to have but better if never used.